The book i’ve been reading is entitled “Renovation of the Heart” by Dallas Willard. It was recommended to me by my pastor out west and i strongly recommend it to anyone who is in serious pursuit of God’s calling in their life. I’ve been trying to get into it for almost 2 years and it hasn’t been until this past month that God has allowed me to begin digesting what it has to offer and it has been both INCREDIBLE, and REALLY, REALLY tough at the same time. One of the many things that the author spends a lot of time on is the abandon of being self-sufficient and self-directing in order to let God take complete control. This is so that not only his perfect plan will resound from our lives, but that we will experience the utmost level of peace, joy, hope, and love that he intended us to. For me, this is something that i’ve heard preached A LOT and really want for my life, but at the same time, don’t know if i’m capable of doing so (which therein lies the problem). While the book is teaching me how to allow God to transform my heart and mind, i struggle with the thought of being able to purse it completely. However, in my morning escape, i came across a sign at Starbucks that oddly enough provided me with some encouragement in the matter (picture below…go look at it now so you can follow what i’m about to say). 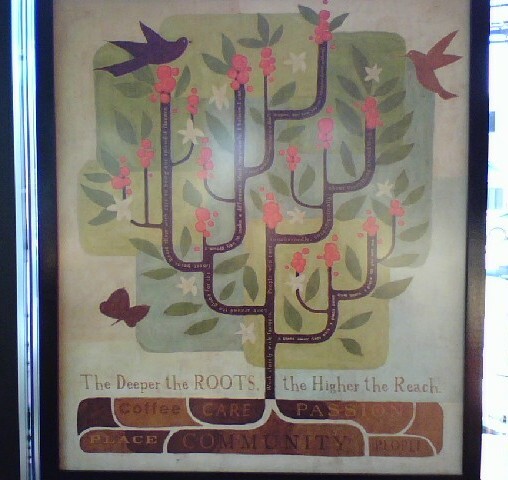 At the bottom, the picture reads, “The deeper the roots, the higher the reach” and the roots of the tree are surrounded with the words “passion, community, people, care, coffee, and place.” With the exception of the last two words (i guess that depends on who you ask) I thought it was an incredible example what Willard has been writting about. I also felt that God was shouting at me in the store “of course it’s hard when you do it yourself, thats why you have ME, MY love, and MY children to help you…so stop worrying about whether or not you can do it, and Ground Your Roots!” I had to smile because I knew it was the truth. So often I forget that and I continually need a reminder that I’m not supposed to do it myself, yet i lack the confidence in Christ to allow HIM to let me reach higher and higher. How could i ever want or accept anything less than that? Next time i’m at Starbucks, i might ask to buy that picture, which is funny because it’s supposed to be about coffee (which is definitely a passion for some…). I also wouldn’t be sursrised if i use that as a sermon example some day…just sayin 🙂 Anyway, take that for what it’s worth. Hopefully this post will serve as a reminder to myself as to where my roots need to be grounded ALL THE TIME! This post has impacted me more than any other in probably the past four or five. In case it wasn’t obvious, I think I struggle with the same thing. …four or five months. And, I KNOW I struggle with the same thing.